TruHair creator, Chelsea Scott, has been in the professional beauty industry for over 20 years. She has specialized in product development and the successful marketing of some of the leading hair care and skin care products that are available on the market today. After owning 2 popular salons and prestige beauty boutiques while working with over 50 of today's most popular hair brands, Chelsea felt like she couldn't find products that allowed us to recreate salon looks at home while being easy to use. 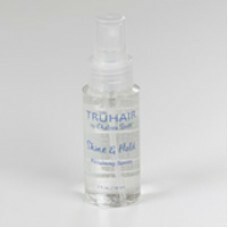 I have been a fan of TruHair products for quite awhile now. I was thrilled to be given the chance to review TruHair Tease Ease Extreme Volume Comb Set along with TruHair Shine & Hold Finishing Spray. Could you do with a little lift? Maximize your hairstyling potential and volumize your tresses with the TRUHAIR Extreme Volume System. 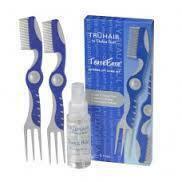 The TEASEase styling comb helps give you tremendous volume without damaging your hair. Lifts hair at crown for that volumized "bump." I personally love to tease my hair to add volume and lift to certain areas of my hair where it needs a boost. I was a girl of the '80s so I definitely know a thing or two about 'teasing' my hair! Nowadays I limit my hair teasing to just a little around my face, thank heavens! Sfter acheiving my desired lift, I spray my hair with TRUHAIR Shine & Hold Finishing Spray to hold my style in place. The lightweight lifting spray helps you set, control and finish any style.